The DAR, founded in 1890 and headquartered in Washington, D.C., is a non-profit, non-political volunteer women's service organization dedicated to promoting patriotism, preserving American history, and securing America's future through better education for children. DAR members volunteer more than 250,000 hours annually to veteran patients, award thousands of dollars in scholarships and financial aid each year to students, and support schools for underserved children with annual donations exceeding one million dollars. As one of the most inclusive genealogical societies in the country, DAR boasts 170,000 members in 3,000 chapters across the United States and internationally. Any woman 18 years or older-regardless of race, religion, or ethnic background-who can prove lineal descent from a patriot of the American Revolution, is eligible for membership. Encompassing an entire downtown city block, DAR National Headquarters houses one of the nation's premier genealogical libraries, one of the foremost collections of pre-industrial American decorative arts, Washington's largest concert hall, and an extensive collection of early American manuscripts and imprints. President General Ann Turner Dillon was elected to the position of President General of the Daughters of the American Revolution after serving the Society in a variety of national, state and local roles. This includes serving as First Vice President General during the Young Administration, Registrar General during the Watkins Administration and as State Regent of Colorado. She grew up outside of Dallas, Texas in Irving. DAR serves women in their communities. Here we are hosting a tea for ladies in a local refuge home. The National Defense Committee was established in 1926 to assist members in carrying out the patriotic, educational, and historical objectives of the National Society and to promote an enlightened public opinion. It has always advocated a strong American military defense. The committee publishes material in support of these positions. designed to preserve our rich American heritage in the fields of art and sculpture, crafts, drama and literature, fiber arts, and music. 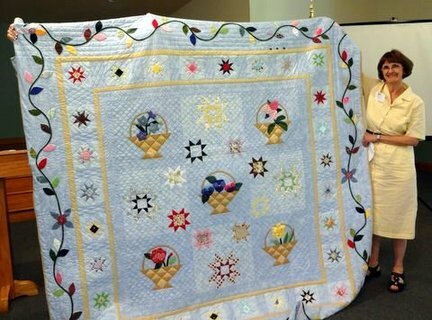 Fort San Luis Member Chary Root received a first place award for her quilt in the Florida DAR American Heritage contest. Each President General establishes a project for her term. “Moving Forward in Service to America,” expresses the ideals and true spirit of the Daughters of the American Revolution. The Service to America Committee was established to capture the magnitude of volunteer service provided by NSDAR volunteers. Through an online tally of the number of hours of service we hope to demonstrate the widespread, significant impact of today's DAR in our communities. Our new President General, Ann Turner Dillon, challenges us to join with fellow members to meet the goal of investing a collective 19 million hours of community service over the next three years. In striving for this goal, members will demonstrate the positive volunteer opportunities associated with DAR membership to current and prospective members; further engage in meaningful service work within the Society’s mission areas; and discover the rewards that come from volunteerism. Fort San Luis Special Grants Committee -sponsor grant to Goodwood Museum and Gardens. A water mitigation grant to Goodwood Museum and Gardens was sponsored by Fort San Luis Chapter, and approved by NSDAR, through its Special Grants program. Trish Mann and Margaret Lewis Rankin, co-chairs of the FSL Special Grants committee, Laura Lee Fisher Corbett, Chairman of FSL's Historic Preservation Committee, and FSL Regent Mary Anne Price, met at Goodwood with Nancy Morgan and Jennifer Humayan, Co-Executive Directors of Goodwood to discuss implementation of the grant. Goodwood has received a check for payment of the first half of the grant. This is the first year that Fort San Luis has submitted applications for these grants, and we were thrilled to receive one. The two historic cottages being assisted through the grant are the Girls Cottage, and Jubilee Cottage (shown in photo). A 3rd generation Floridian, I became interested in genealogy about 25 years ago. Among some of my mother’s papers I found documentation for my Revolutionary Ancestors. My oldest daughter, Laura, insisted that I join DAR so it would be easy for her when she decided to join, and then she joined through her father’s line! I have been an active member since day one. Within 5 years of becoming a member I was serving as Chapter Regent. Following that, in 1999, I was honored to be elected State Curator. Never in my wildest dreams did I ever think I would be traveling this path when I joined DAR. I believe in the United States of America as a government of the people, by the people, for the people; whose just powers are derived from the consent of the governed; a democracy in a republic, a sovereign Nation of many sovereign States; a perfect union, one and inseparable, established upon those principles of freedom, equality, justice, and humanity for which American patriots sacrificed their lives and fortunes. I therefore believe it is my duty to my Country to love it; to support its Constitution; to obey its laws; to respect its flag; and to defend it against all enemies.